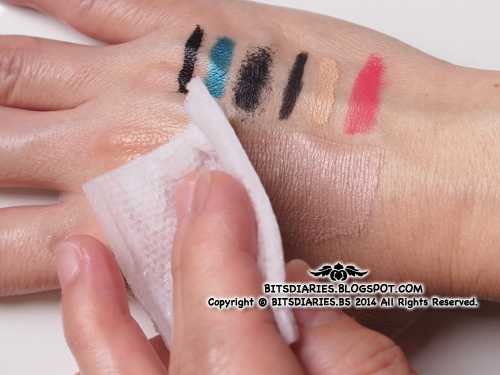 As seen in the first picture of the post, the bottle of makeup remover is packed in a transparent rectangular plastic box with details printed on it. 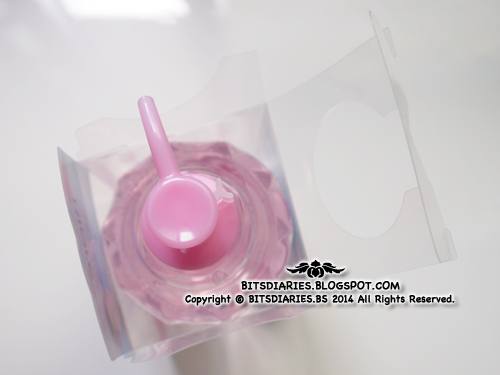 It comes in a transparent pink-color soft plastic bottle with a pink screw-off pump lid. 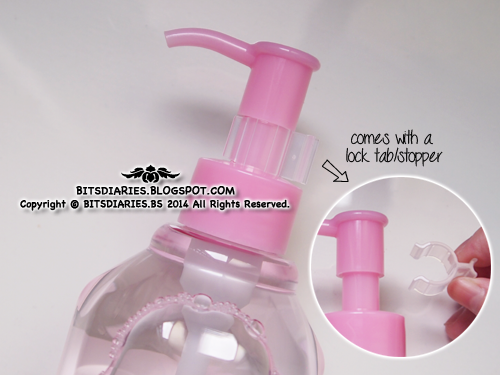 Similar to the Aqua Jelly Make Up Remover, this also comes with a lock tab/stopper to prevent spillage. It has a transparent, watery texture and it's not greasy at all. The skin may feel sticky right after application but once the product get absorbed/evaporated, it will not leave any sticky or greasy layer. This product does not contain any artificial fragrances; it's fragrance-free. 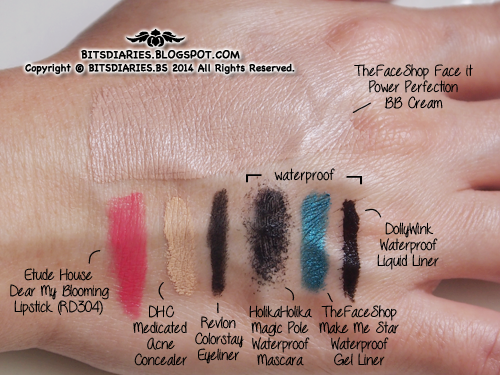 Flooded my mom's hand with lotsa makeup swatches — consist of waterproof and non-waterproof. LET'S BEGIN THE CLEANSING DEMO~!! 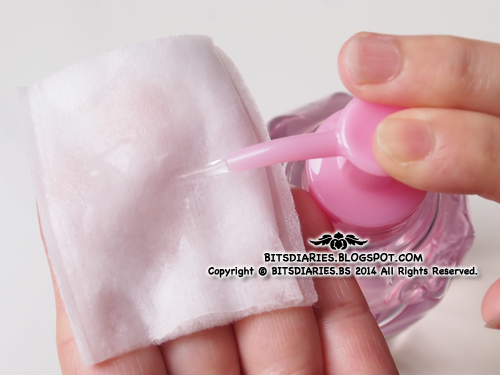 Moisten the cotton pad with 2-3 pumps of cleansing water. 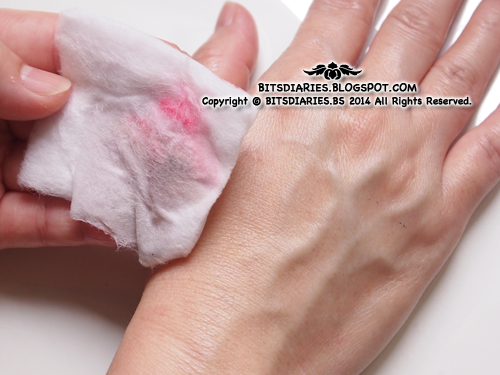 The BB Cream was completely removed in just ONE SWIPE! 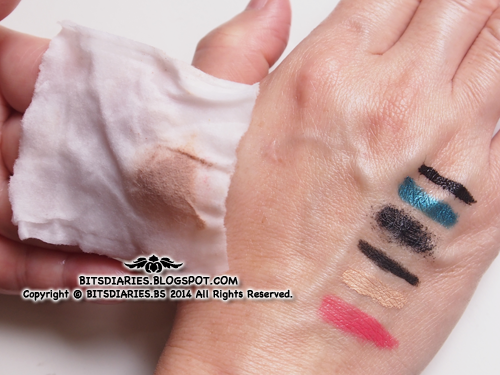 99% of DollyWink Liquid Liner removed. The Face Shop Gel Liner and Holika Holika Mascara still remained. 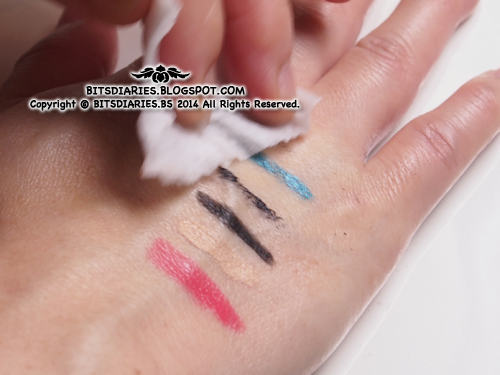 In just one or two swipes, it dissolved and lifted off all the non-waterproof makeup effortlessly! 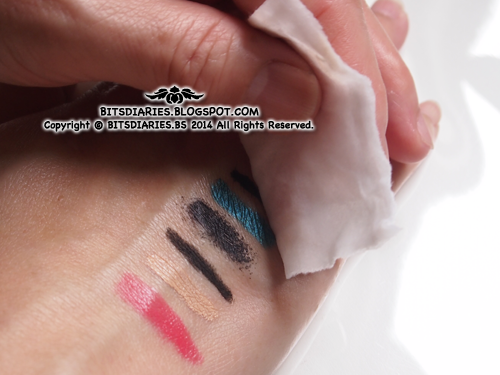 Whilst for waterproof makeup, it took more than two swipes to remove the liquid liner and mascara but it did not completely remove the gel liner, as seen in the following picture. 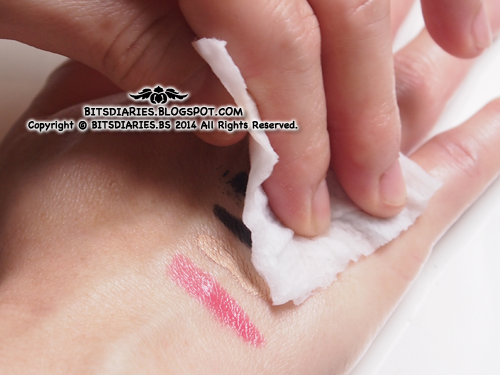 There were still some traces of gel liner left on the skin after swiping six times. It can't be removed unless I force it off. Well..., some makeup products are designed to be waterproof yet clean off easily, while some are quite hard to clean off. With that said, I think this cleansing water may not be effective in removing those extreme stubborn ones. Also, the number of swipes it takes may vary depending on the formula and the amount of makeup you wear on your face. 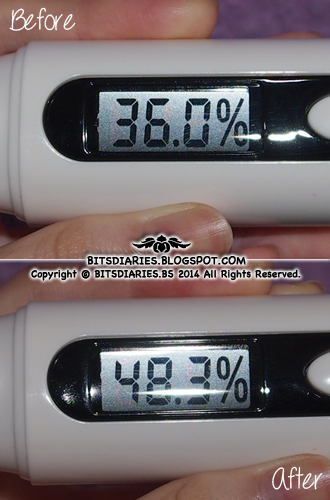 Before the application of the cleansing water, my mom's skin moisture level was 36.0%. 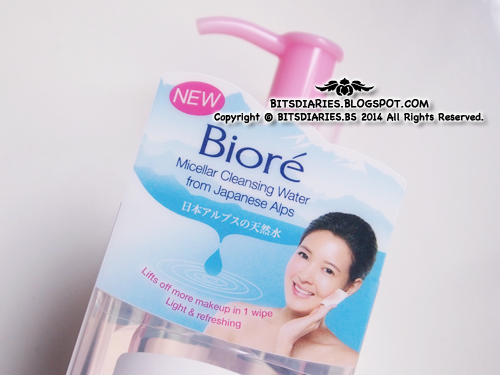 After application of the cleansing water, my mom's skin moisture level increased to 48.3%. So instead of losing moisture, my mom's skin moisture increased. Therefore, I concluded that this cleansing water isn't drying at all. 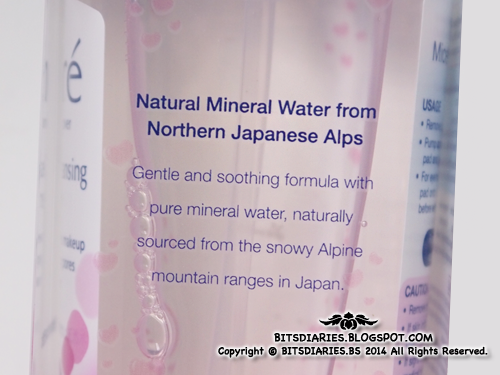 In fact, it hydrates the skin, leaving skin quenched. - no-rinsing required; good to go to bed! Verdict: Eyeliner and mascara are the only waterproof makeup I wear; I have a habit to use a separate makeup remover for the eye areas so... although this Micellar Cleansing Water did not do a good job in removing certain types of waterproof makeup, it doesn't bother me too much. On the positive side, it removed non-waterproof makeup effortlessly and effectively, without leaving my skin feeling greasy or sticky. It did not dry up my skin or cause any breakouts either. Micellar Cleansing Water is a gentle, lightweight and non-oily water-based makeup remover which is perfect for all skin types, including oily and sensitive skin! As it's a non-rinse makeup remover, right after using you're good-to-go to bed. It's awesome and perfect to use on lazy days! 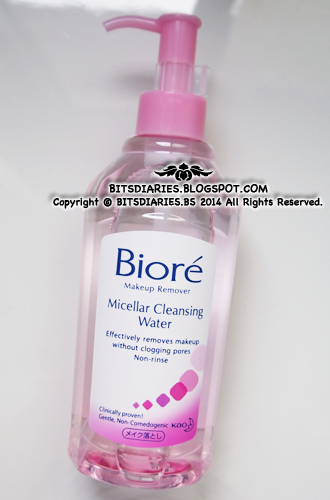 Where to get: The NEW Biore Micellar Cleansing Water is available in all pharmacies, hypermarkets and supermarkets, and major departmental stores. 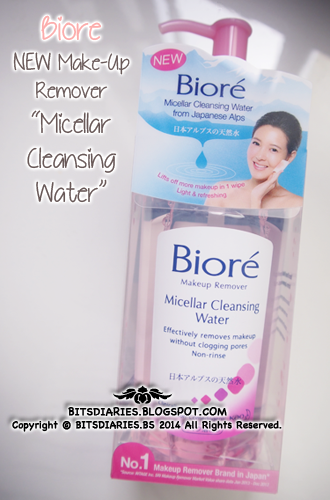 Simply register a Sample Store account https://www.samplestore.com/r/89441 and redeem a sample of Biore Micellar Cleansing Water via https://www.samplestore.com/product/details/2896/0/name-biore-micellar-cleansing-water.